Our optimum health depends on optimum functioning of all endocrine hormones at the cellular, biochemical level. Many patients experience poor health or impaired well-being due to inefficiencies in endocrine systems, especially related to adrenal and thyroid hormones. Thyroid hormones regulate intracellular metabolic rate, the speed or efficiency of biochemical activity, which controls efficiency of organs and systems (immune response, tissue repair, detoxification, energy processes, neurotransmitter production, etc.). Learning how the thyroid functions will help you understand what may be out of balance in your body and causing symptoms. The thyroid gland uses the mineral iodine and l-tyrosine, an amino acid, to produce l-thyroxine (T4), which is subsequently converted to tri-iodo-l-thyronine (T3) and its isomer reverse T3. T3 is the primary active hormone within the cells. The synthesis and release of T3 and T4 are regulated by the pituitary gland which releases thyroid stimulating hormone (TSH) when the levels of T3 and T4 are too low. 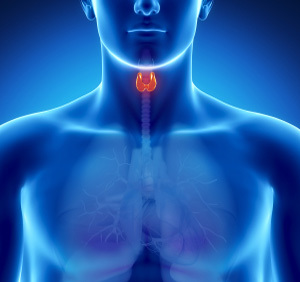 Having balanced levels of TSH, free T3 and free T4 is crucial for your thyroid health and overall wellness. Problems associated with the thyroid gland are production problems (hypothyroidism for low production, hyperthyroidism for excessive production) and are considered primary problems; these may be related to genetic predisposition, development of autoimmune responses, or thyroid tumors. The most common symptoms for low thyroid levels are weight gain, fatigue, sensitivity to cold, hair loss, constipation and depression. Symptoms for high thyroid levels are anxiety, insomnia, rapid heart rate, diarrhea and weight loss. There may be secondary hypothyroidism causing low thyroid symptoms even though the production of thyroid hormone appears to be normal. These are essentially utilization issues which may or may not be related to production. To evaluate the utilization of thyroid hormones at the cellular level, four factors must be considered; production efficiency, degree of protein binding, conversion efficiency, and receptor response. 1. TSH levels are considered the standard for evaluating production. The newest national standards define normal range for TSH as 0.3 to 3.5, however, local labs still use old standards which identify much higher TSH values as normal. Functional medicine practitioners generally try to maintain TSH values less than or equal to 2. Common factors (other than disease processes) that might affect production include inadequate protein intake or impaired protein digestion (less l-tyrosine available) and drinking tap water (both chlorine and fluoride can displace iodine binding). 2. The majority of thyroid hormones in circulation are bound to a storage protein, thyroid binding globulin; only the unbound or free hormone is available for activity. The most common factor reported that affects binding globulin is relative level of estrogens. It has been documented that any oral estrogen supplementation increases thyroid binding globulin and it is generally recognized that relative estrogen dominance has this same effect. Remember, increases in binding globulin mean less free thyroid hormone, thus lower cellular activity, although the usual T4 lab would not change since it measures both bound and free hormone. 3. Appropriate conversion of T4 to T3 is a delicately balanced process, primarily regulated by adrenal activity. Free T4 is converted to free T3 and reverse T3; the free T3 is active (increases metabolic rate) but the rT3 isomer merely blocks receptors, reducing activity. Adequate cortisol is required for proper conversion and the 7-keto metabolite of DHEA has also been demonstrated to increase free T3 levels. Additionally, proper tissue levels of selenium, iodine, zinc, and copper are necessary for effective conversion. For example, the enzyme involved in peripheral (cellular) conversion of T4 to T3 requires selenium as a cofactor, although the pituitary conversion process does not, leading to a scenario where TSH is normal but cellular activity is sub-normal. Similarly, iodine is required for production of T4, involved in conversion of T4 to T3, and necessary for metabolic breakdown of estrogens (and higher estrogens lower thyroid hormone availability). 4. Alterations in cellular receptor response to T3 lead to a functional impairment that might be considered thyroid resistance. Factors known to decrease or impair response include high insulin levels, elevated cortisol levels (stress response), and elevated mercury levels, as well as other heavy metals and some environmental toxins. Testing the correct hormones for thyroid dysfunction is very important. At Holistic Harmony we run a thorough blood panel to assess TSH, Free T3, Free T4, Reverse T3 and TPO and Thyroid Globulin Antibodies to assure that your thyroid is being balanced in the best way possible. These values must be interpreted in relation to each other (not just to the normal ranges) in order to assess production and conversion efficiency. The next step is a functional measurement of the effect of T3 in the cellular biochemistry, accomplished with an oral thermometer. The average morning oral temperature, measured for several consecutive days, as an appropriate marker for basal core temperature. Our biochemistry is such that optimum function occurs when our temperature averages 98.6 degrees; an average temperature less than 98.2 degrees would be considered significant (our biochemical engine is idling too slowly). Intervention may be as simple as supplementation with selenium or iodine, as involved as chelating excess mercury, or may require prescription thyroid replacement. The best thing about correcting hypothyroidism is how good it feels when all those symptoms go away and you feel vibrant again! If you're interested in a Hormone consultation, please call (402) 486-9373 or contact us online right away. There are 3 stages of adrenal fatigue and the only true way of knowing what stage you are in is to test your most abundant adrenal hormones, cortisol and Dehydroepiandosterone (DHEA). DHEA is a hormone produced in the adrenal gland and is the most abundant steroid hormone in the body. It is referred to as the "mother hormone" because it has unique properties that allow it to help to balance the entire endocrine system. Falling levels of DHEA are closely associated with a number of age-related diseases and disabilities. DHEA has been shown to have a number of benefits with regards to anti-aging, weight loss and management, strengthening of immune function, balancing thyroid function, improving memory, improvement of moods, increasing muscle mass, boosting of energy and fighting allergic reactions. Testing levels is critical, do not take DHEA unless you have been tested and diagnosed with a deficiency. If a deficiency is found, supplementation can be beneficial for both men and women. Elevated cortisol levels: interfere with learning and memory, lower immune function and bone density, increase weight gain, blood pressure, cholesterol, heart disease. Cortisol is released in response to fear or stress by the adrenal glands as part of the fight-or-flight mechanism. It is important to have normal levels of cortisol levels in the body. Too low of cortisol levels can be as detrimental as too high of levels. This is why it is so important to test you levels to know how to treat your symptoms. Signs and symptoms of adrenal hormone imbalance are fatigue, mild depression, anxiety, irritability, insomnia and weight gain, especially around the belly.